We’re a bit late. As we look at the review of the Archos 80 Helium 4G, it has already been replaced by the 80b, which offers some minor improvements over this one. However, this is still available from the likes of Amazon, and costs only £166, which makes it a great tablet with built in 4G abilities, and unlike rest of the pack, it even lets you make phone calls. However, with an 8 inch screen, you will probably not be using this as a phablet as much as the Note series managed to change our mind. All in all, as you can see, a fairly decent spec for a reasonable price, but nothing worth shouting about. Overall, a thick bezel on the front frames the screen, while the back features a two tone plastic/silver metal finish, holding the speakers, the slot for the SD card/SIM and the camera. The side features the Power/Volume buttons, the microphone, the microUSB port and the 3.5mm headphone/headset port. The thick plastic surrounding the tablet gives it a tough feel, though we didn’t do any drop tests. With vanilla Android, and a low resolution screen, there wasn’t much pressure on this tablet as it came out of the box. However, with an entry level processor, you are probably using this as more of a browsing, Facebooking, emailing and Skyping device rather than playing intensive games. For the former though, it works great, and if you are in the market for a portable communication device, it does the job well. Archos do pack in a few of their own apps, but what you get is as Vanilla as Android gets, so nothing extra, no skin and all. What does make this tablet shine above others is the 4G modem. Not only does it give you 4G speed for data, but unlike many other tablets that offer the same, this one actually allows you to make phone calls, send messages, etc. While we wouldn’t recommend using this as a phablet, and it looks oh so silly against your face, but you can use this paired with a headset, and you’re good to go. In fact, if you were to use this as a phablet, the 3500mAH battery actually lasts the whole day of intensive use, so you really are good to go. The cameras are okay, but okay for tablets. Once again, nothing you’d be impressed with, but purely functional. 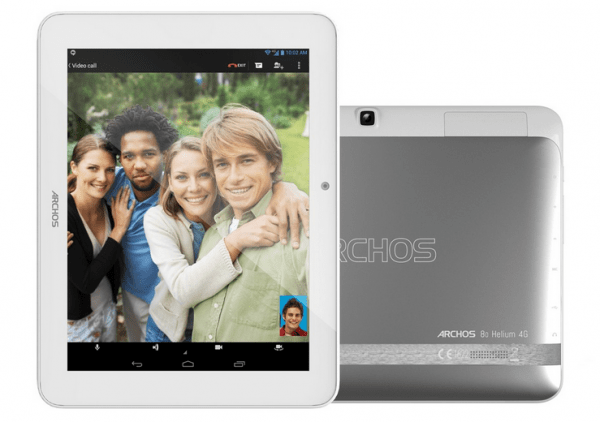 As mentioned, this isn’t the latest and greatest from Archos, but can be bought from the likes of Amazon (sold by Archos) for £166. This one is a mixed bag. A decent processor, with the highlight of 4G, part phablet, mediocre screen, okay cameras. Add that to a very low price, and it doesn’t look all too bad.